Having ripped back on a number of projects recently, I’ve been thinking a lot about mistakes. 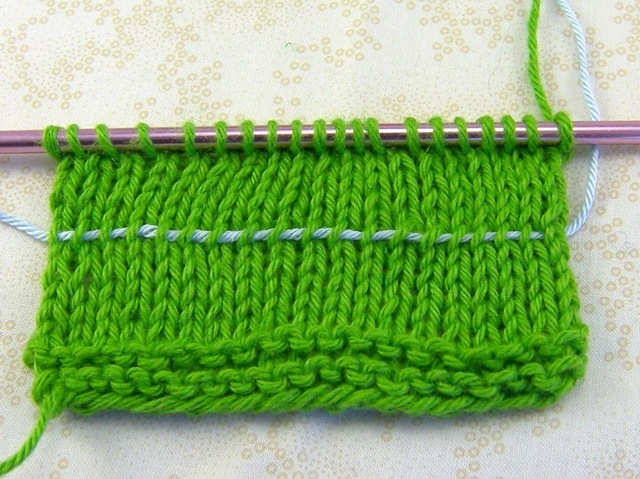 Some mistakes are easy to fix, involving just a single stitch or maybe three or four. Or there are the mistakes that require you to rip back rows and rows of knitting. In detailed lace knitting, knitters will thread a lifeline every few rows or every pattern repeat. A lifeline goes through a specific row of stitches so that when you have to rip back, you know which row you’re on and it’s easy to put the stitches back on the needles. Well, most of us usually don’t put in lifelines as we’re knitting. I sometimes think about it and then am too lazy to do it. So what I end up using is what I call the afterthought lifeline. Like an afterthought heel, it’s put in after the fact to save you from pain and heartache. It’s easiest when done on stockinette stitch, pretty straightforward on ribbing, and can take a little practice with fancier stitches. I’m not sure what it says about my knitting, but I’m now practiced enough to do an afterthought lifeline pretty well on cables and lace. 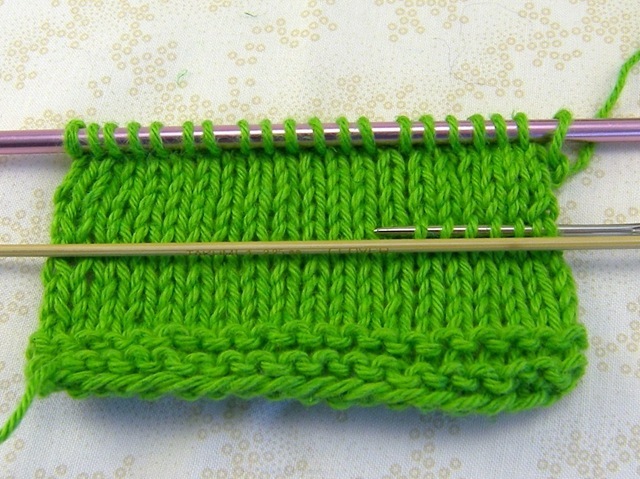 You’ll need a tapestry needle and some scrap yarn long enough to go through your project. 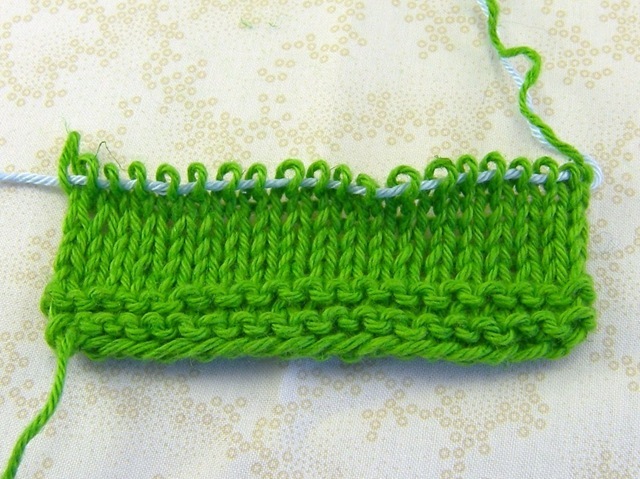 The yarn used for this tutorial is Knit Picks CotLin, in Key Lime; the scrap yarn is Patons Grace in Sky. This is a swatch of stockinette. We need to decide which row we’re going to rip back to. I like to use a spare needle to help me keep track of columns of stitches. Now I’ve placed the needle at the bottom of the row where I want to put my lifeline. 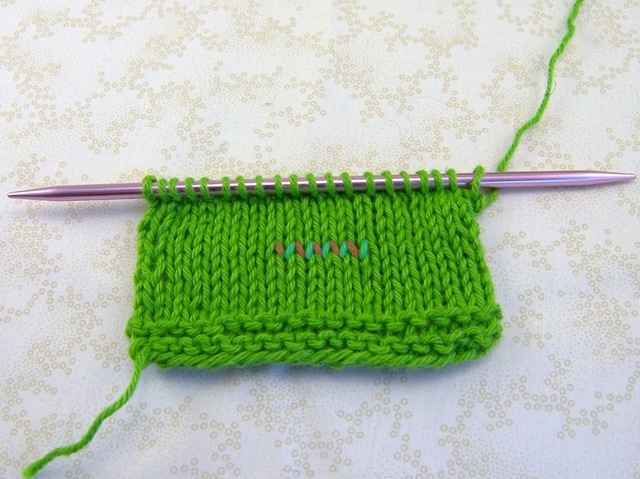 Remember that a knit stitch forms a V; each V lines up with the one next to it. 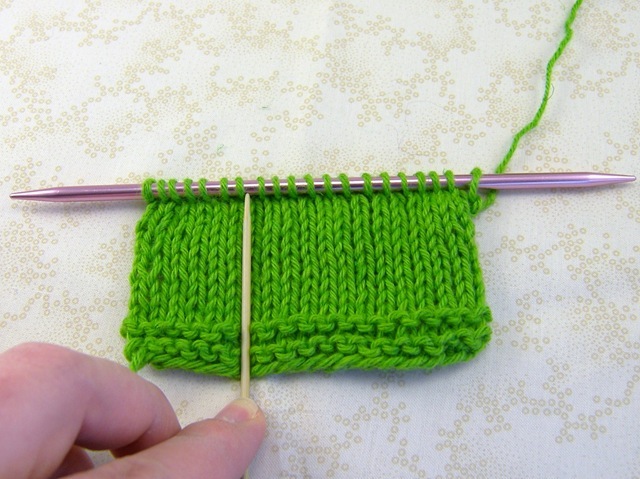 Using a tapestry needle threaded with some scrap yarn, pick up the right side of each stitch. 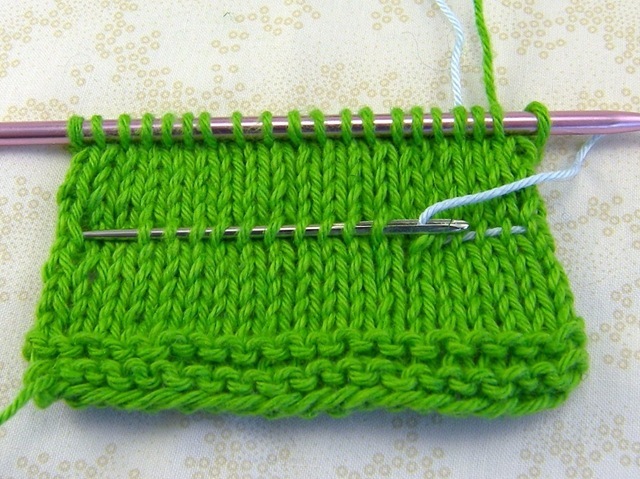 If you pick up the left side of the stitch, the stitches will be twisted when you put them back on the needle. 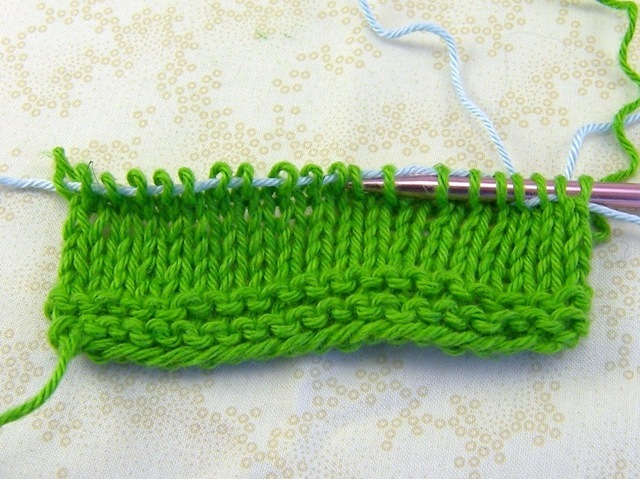 It can take a little practice to pick out the next stitch in the row without a guide; try practicing this on a spare swatch to get the hang of it. Yes, I am using the world’s largest tapestry needle. I’m pretty sure they wouldn’t let me take that thing on a plane- it’s 3 inches long and thicker than my size 1 needles! Once the lifeline is in, take a deep breath, pull the needle out and rip back with gusto. The lifeline will keep you from ripping back to far. If you ended up loosing the row and threading some of your lifeline through the row above your chosen row, you can transfer the stitches back to the needles and tink from there. Or move the lifeline around, or whatever works for your knitting. Depends on the project and the number of stitches from the wrong row. Experiment, there’s no wrong answers here. Put the stitches back on the needle and return joyously or resignedly to your knitting. I’ve always wondered how to add a lifeline to my knitting, so thank you so much for sharing that tutorial! Very helpful. I’ve had to do this way too often myself. One time on the Clessidra knee highs that I did. Oh boy that was fun! Jiminy cricket! I just found out what a lifeline is, and I’m wondering why I didn’t think of it before… and then I was wondering what to do if you hadn’t thought of it before, but wanted to add one (cuz you just KNOW you messed up somewhere in there, and wanted to rip instead of tink!). I wouldn’t have understood to put it into the right side of the V. THANK YOU! You’ve saved me a lot of worry and trouble. thank you so much! my sock had an unfortunate run in with my cat and every time i try to unravel and pick up again it just unravels more. i can’t wait to try this! I just want to say thank you sooooo much! Your post saved a project for me. I didn’t know an afterthought life line was possible-thank you! Do you have any tips for an inexperienced knitter about placing an afterthought lifeline in cabled work? Oh thank you! I was just contemplating tinking back 8 rows of lace with hundreds of stitches and trying to convince myself I could live with a messed up repeat. I’m going to try this instead!! I have been looking for a tutorial on making an afterthought lifeline in ribbed work. 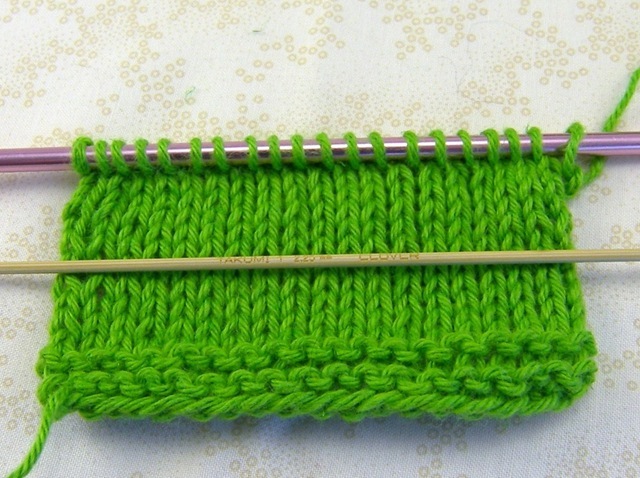 You mentioned that it’s simple, but I can’t figure out how to insert the needle into a purl stitch, coming after a knit stitch. I haven’t been able to find this anywhere online. Any tips? Thank you very much for such a clear description – my kitten attacked my knitting project and managed to pull it half off the needles, so I need to frog back a few rows. You are a lifesaver!! The triangle scarf is nice and it is almost the same as the one Bernat came out with, It is in Seaters & Accessores book # 530201(if you try it there is a typo on the web site) I’m just having trouble with there starting instructions because mine is backwards copared to theirs. 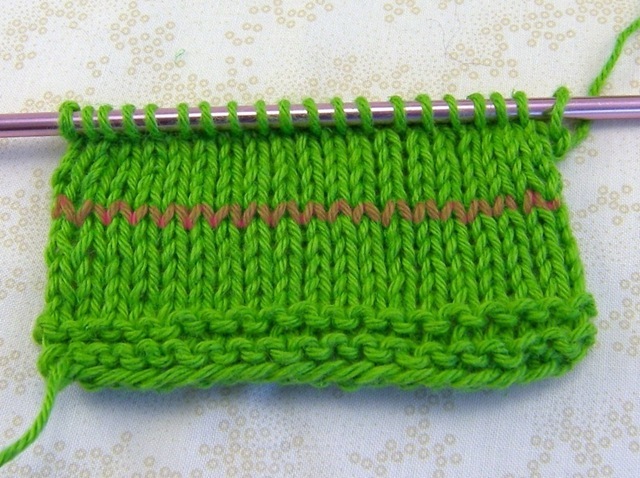 I wonder could you post a pic of how to do this in garter stitch or ribbing? I find it just as easy to use a long small-gauge circular, usually a 40″ size 0, to pick up the stitches, instead of a needle and thread. This way when you rip back, you can knit the sts directly back on to your working needle instead of having to slip all those sts. DO BE SURE to place point protectors on the ends of the small circular so it doesn’t slide out while you are frogging. Ask me how I know!!! I agree wth this 99% – the 1% is that I use a long circ with tips several sizes smaller than the working needles, instead of needle and thread. Then when I rip back I can knit the sts off the circ, instead of having to pick up all those sts! Great advise and easy to understand. thanks for putting this online for the “I know I should do this, but it’s an extra step” people, like me! So, this entry just saved me a ton of work! Will blog about it soon but had to share the awesomeness with all of you! I hope I can do this! I am trying to get back to knitting after over 20 years and I am making lots of mistakes! Thanks to you all for the instructions.